The Gayle has landed. Three years ago Somerset were salivating over the prospect of Chris Gayle playing for them in the T20 Blast, only for his rapprochement with the West Indies Board to scupper those plans. But Gayle had always said that, when he made his belated debut in England's T20 competition, it would be for Somerset. The standing ovation that greeted his dismissal spoke of the impact Gayle had made upon the Chelmsford crowd, supposedly one of the most raucous away crowds he could have faced. So too did the desperation of hoards of fans afterwards to get autographs, selfies or, in the case of a few, even a kiss on the cheeks. It spoke of a cricketer with transcendental power. Chelmsford had enjoyed - endured even - an archetypal Gayle T20 innings, even down to the almost ostentatious care with which he played himself in. After leaving a succession of balls, holding his bat carefully inside the line, it took Gayle until his sixth ball, a gentle push to midwicket, to get off the mark. Eighteen balls in and Gayle had only six runs. "Beautiful, it's a great start," Chris Gayle said after summoning a matchwinning 92 on his first innings for Somerset, hours after meeting his team-mates for the first time. "A last-ball thriller in my first game so I can't really complain. We got across the line. It's a short stay over here, so I'm looking forward to entertaining the fans as much as possible." 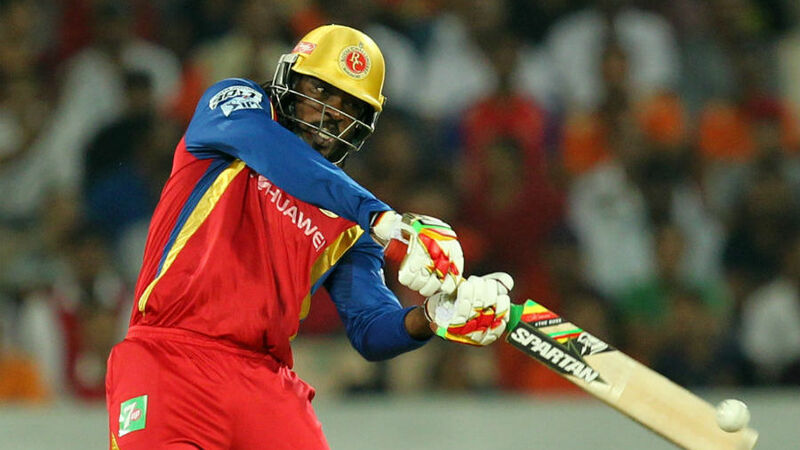 As so often in T20, Gayle batted with caution in the Powerplay before exploding later. "It's too cold for me but I stuck it out," he joked. "It was something myself and Trescothick discussed in the middle. I didn't want to make such a slow start and then get out because I know with my capabilities, I knew the runs would come so I'm very happy. "It's been good, I haven't really had a chance to have a net, I've been in London and this was the first day catching up with the team. It's a mental thing, it won't happen like that all the time." Then it happened. Flats were cleared, marquee roofs were hit and dozens of spectators who had parked their cars were left fearing for the safety of their vehicles. Having cleared humongous grounds the world over, Gayle seemed like a man affronted by the puny size of Chelmsford's boundaries. With laconic foot movement - and with such power and timing, why bother? - Gayle swatted deliveries through mid-on and cleared the legside boundary with six sixes, each more awesome than the last. Gayle's impact goes beyond his mere runs. That much was clear from how Essex coped once he had located his swagger: they bowled five wides to him after he had reached 50. Straight after reaching that landmark, Gayle cut Reece Topley to third man. It was hard and low, but David Masters was in a perfect position and should not have shelled it. Gayle's next shot seemed like an innocuous forward push, but thundered through mid-on for four. After another four, Gayle launched the final ball straight over the scaffolding behind the bowler's arm. Suddenly, Somerset were cruising towards their target of 177. It looked, too, as if Gayle, representing his 12th club in T20 cricket, was en route to his 15th T20 century. But after he was sharply taken at Greg Smith at midwicket on 92, Somerset almost contrived to make a mess of the 13 required in ten balls. Tom Cooper nonchalantly flicked his first ball for six over square leg, but was run out in a moment of panic next ball. Essex entrusted Ravi Bopara with the final over, and he almost succeeded in preventing Somerset get the five more they required to win. But a single scampered from the final ball, after Lewis Gregory had dropped the ball into the legside, ensured Gayle's belated Somerset debut had the result it deserved. However enticing the prospect of a Gayle-Trescothick opening partnership, the Chelmsford crowd also longed for Essex success after three defeats in their first four T20 games. And for all the focus on Gayle, exuding a typically unperturbed air patrolling the infield, Essex have a belligerent left-handed overseas opener of their own. In the third over of the innings, Jesse Ryder played three ferocious pulls off Sohail Tanvir, the second sailing over the square leg boundary for six. With his classical technique, Tom Westley provided an ideal folly; together the two added 90 in only 8.1 overs. It was a position from which Essex would have had designs on 220. Jim Allenby ensured otherwise, bowling wicket-to-wicket at a speed that forced the batsmen to generate their own pace. Besides the openers, no other player passed 16. Yet again, Somerset were grateful to the death bowling nous of Alfonso Thomas, whose final over yielded three runs and three wickets. In the process he became the fourth ever bowler to pass 250 T20 wickets. Few bowlers have more T20 pedigree, which is why South Africa attempted to entice him out of his Kolpak deal with Somerset in 2012 to play in the World T20.